It is a hilarious time on the dining table when the little children are eating spaghetti. Funny & messy too, but once in a while I let my kids have that messy time while they eat, for they do enjoy the spaghetti while they are having fun. Those long unmanageable strings hanging down from the fork & then from their mouth and the intentionally “ZOOOOP”, when they all disappear inside at one shot behind that gleeful smile. For some reason when it is spaghetti, they always want to feed themselves. The twinkling mischievious looks, the sauce studded mouth & a full tummy.. well it is worth it. Now to the Skillet pasta… or “Skilletini” as they call it in Johnny Carinos. If you have ever visited this restaurant, you would know what I am talking about. When you order the Skilletini, it comes hissing, sizzling & steaming in an iron skillet- sounds more like a Fajita than an order of Pasta. And it is delicious, with the vegetables ( you can order your choice of meat or shrimp) , & pasta sizzling hot in the spicy Marinara Sauce. No I am not doing a review here… we all just love the look, feel & taste of this dish. 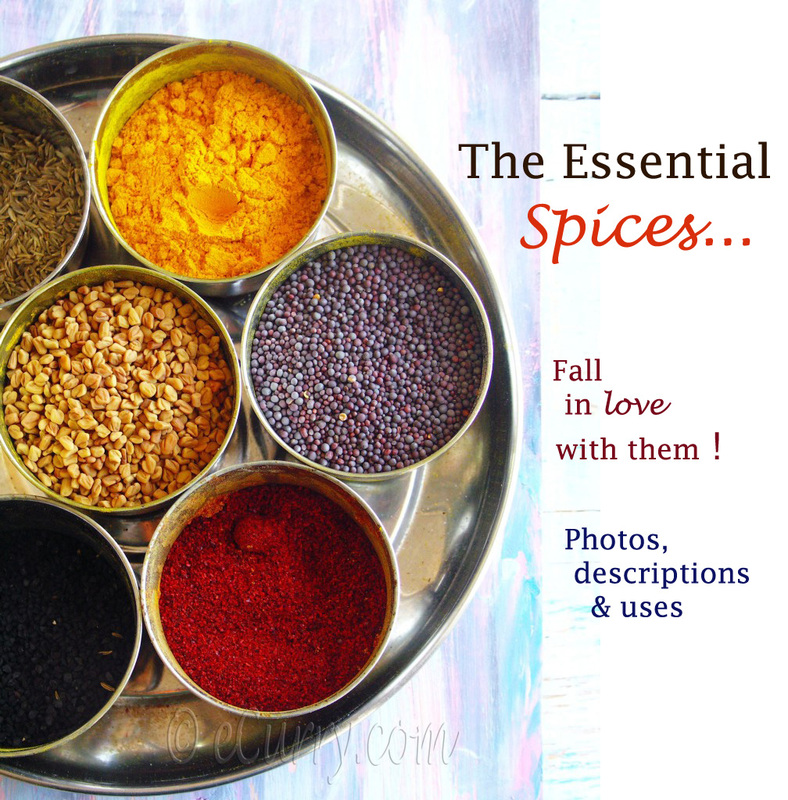 Here – sending this to JUST FOR U hosted by Alka of Sindhi Rasoi… this is for my Family. Having an iron skillet at home, which i have been using for the past 12 years, I recreate the Skilletini quite often at home. Everyone loves it, & it is quick – a 30 minute meal. I usually add some protein to it… but did not while I made it today.. 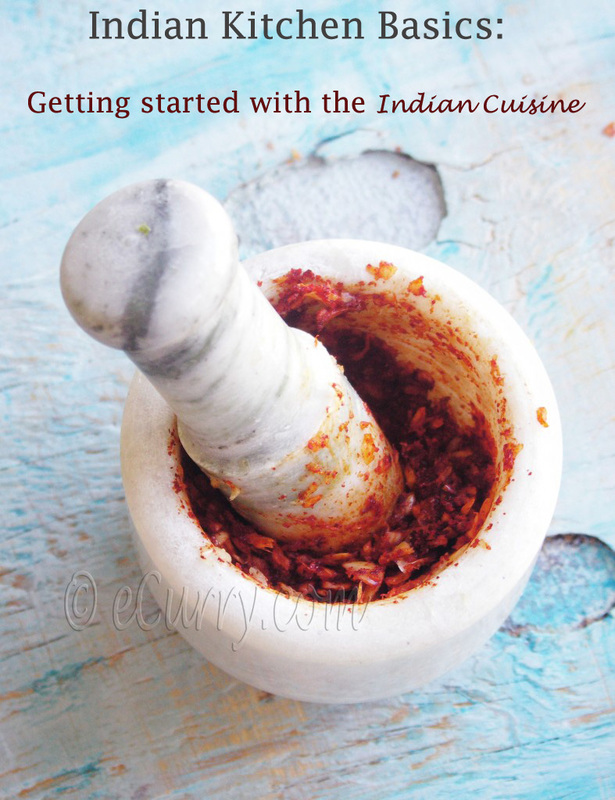 It is a pretty free style recipe, add whatever you want kind of thing. So please cook your own kind. Note: Add any of your favorite Veggies. Makes sense to add beans or Tofu (or any meat if you want ) to make it a complete Family meal. Cook Spaghetti al dente according to instruction. Drain but SAVE the water! Heat the oil in the skillet. Add the Red Pepper Flakes & the cracked Black Pepper. When the peppers sizzle add the minced garlic. Stir them for a minute, making sure they do not get dark. Add the Celery, Onions & the Peppers. Stir Fry till the Onions are translucent. Now add the chopped tomatoes, Tomato puree & the sugar & salt. Add 1/2 cup of the drained water. Combine well with the existing things in the skillet. Cover & simmer at low heat for about 10 minutes. Uncover & add the Broccoli & any other veggies if you are using them. Cover & simmer for another 5-7 minutes. Uncover add the boiled Spaghetti to the sauce & increase the heat to high. Add the herbs. Combine the sauce with the pasta & cook while tossing them till the sauce almost dries up in the pan & you start to hear the hiss & the sizzle. Garnish with freshly ground black pepper & fresh herbs if you want. As usual we had a great Table Time:-) The Flavors merge in better with the spaghetti being actually cooked with the sauce rather than adding it on the pasta separateley. Some of you might like it with a sprinkle of cheese on the top. 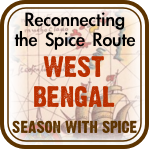 Again make it your way….This is being sent to FIC Orange Started by Sunshinemom of Tongue Ticklers & hosted this time by Aparna of My Diverse Kitchen & to Vaishalii’s Vegan-Italian Event. Is there any kid who doesn’t like pasta? I use my skillet for frying, probably my next pasta dish should be in skillet! Great dinner! Never tried my spaghetti in the skillet. I have tried to reccreate the fried Chinese noodles by frying them on high heat in a steel pan recently, but it was nowhere near the taste of the original. I guess, the cast iron skillet is the key. 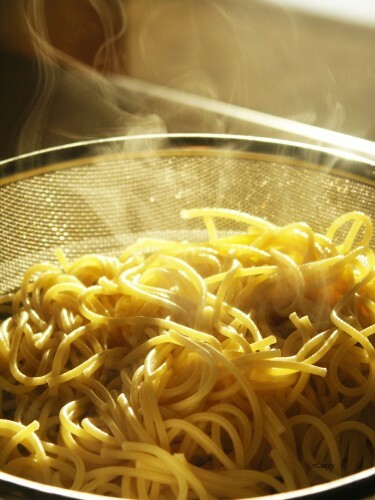 Love your pictures, especially the one of the steaming spaghetti! Thanks PG! Yeah the iron skillet can retain that heat without burning the food! Great idea. Makes the spaghetti very flavorful, I bet. 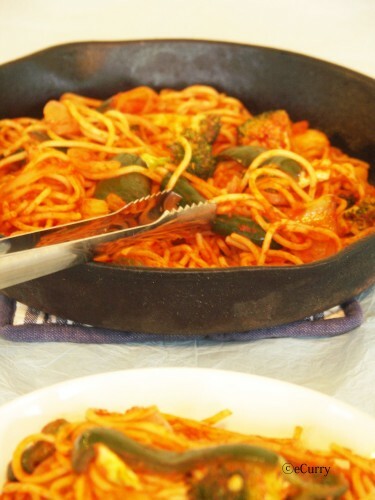 wow what a yummy spaghetti…and the new look is amazing too. Looks absolutely delicious. We had pasta tonight. Thanks for painting this post “orange” for FIC. This is pure comfort in action dear. I am with the kids on this one ha! ha! Thanks mom! You have that extra sauce going on here that I love! Beautiful!! Loved all the pictures. If you like, you can send it to Vegan – Italy event at Vaishali’s holy cow! Thanks Meera.. & thnx for letting me know.. I did send it to her. hmn..nice new look of the website !! and wondeful recipie as usual !! Good Going ecurry !! Soma, this looks delicious. To answer your question, sure, go ahead and send it in to It’s A Vegan World. I’d love to add it. ohh i am dreaming of spaghetti now 🙂 those pics…. man! gorgeous..
Mouthwatering pics… Loved the brocolli in it. Thanks !! i am yet to see that movie..:-( i am yet to see a LOT of movies…. I CANNOT recollect that ad!! Who would have thought! This dish looks awesome, I’ll be adding some chicken for some protein. 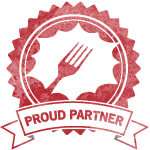 You have a great site, keep on cooking! If you give me that bowl of spaghetti, I promise to make that “Zooooop” sound while eating, ha ha ha! So mouth-watering Soma! Stunning pics. 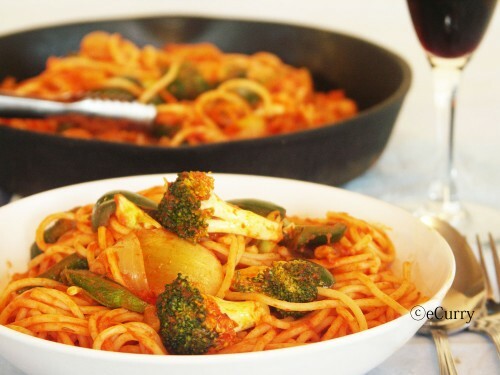 This sounds delightful, and I would have never thought to make spaghetti in a skillet! My first thought was the spaghetti would stick all over but the skillet must be so well seasoned with all those years of use. 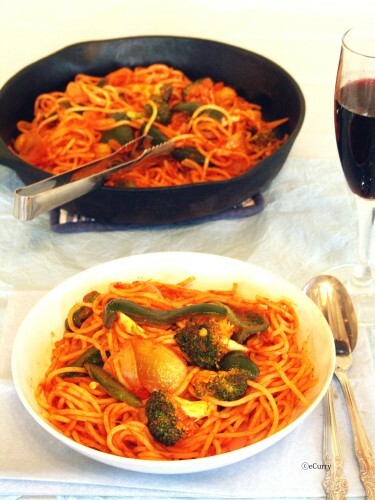 wow, love the pic soma, the spaghetti looks fab. Soma – This is awesome. Should try pasta in the skillet next time. Just cooked this today – was looking for a Spaghetti recipe that was not a bolognese. 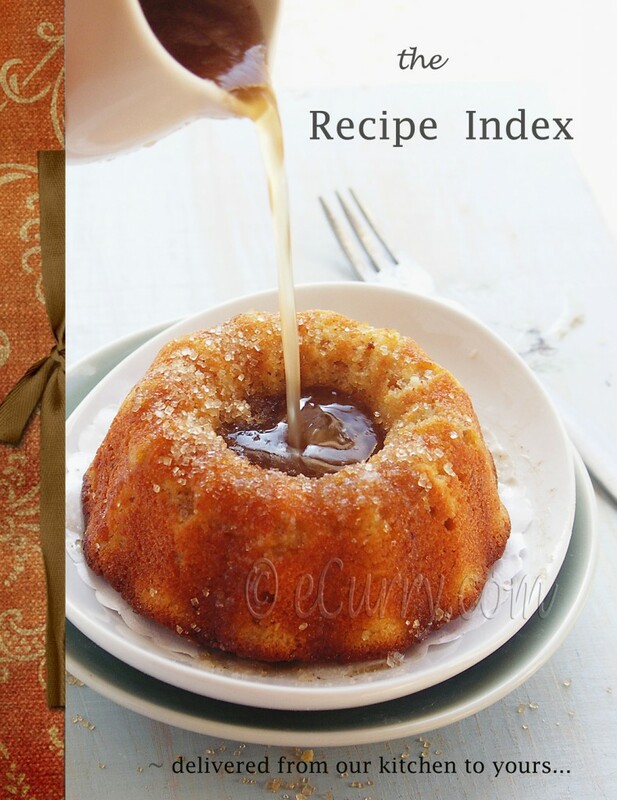 We really enjoyed it and it is now in our recipe book! I am so glad you liked it. Thank you very much for taking your time & letting me know. I really appreciate! Vegan Italian: The Roundup - Holy Cow!